Today I am going to talk about StackWise virtual on Cisco catalyst 9000 switches. 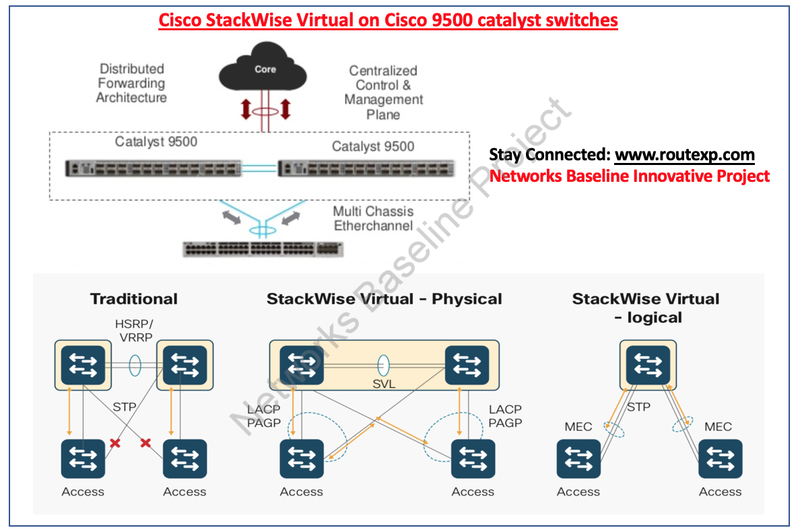 Cisco Catalyst 9000 series uses StackWise virtual and StackWise virtual is the technology similar to VSS earlier used in Cisco catalyst 6500 and Cisco 6800 catalyst switches. What is Cisco StackWise Virtual? Cisco StackWise virtual is a technology to cluster two different physical devices into a single logical device. With the help of StackWise virtual you can have single control plane with two different data planes having two different devices.The two devices work as one and share the same configuration and forwarding state. StackWise Virtual also integrates other resourceful features like Stateful Switch Over (SSO), Non-Stop Forwarding (NSF) and Multi-chassis EtherChannel (MEC) that permit non-stop communication with improved bandwidth to significantly boost application reply time. Within a StackWise Virtual domain, one device is designated as the SV active switch, and the other is designated as the SV standby switch similar like we are doing in the traditional VSS where one switch is primary and other is secondary switch. Control plane features like SNMP, Telnet, SSH, BPDUs, PDUs, LACP, STP, UDLD, Flow control and Layer 3 routing protocols like BGP, OSPF, EIGRP features. How to verify active switch in the StackWise virtual? Switch performing as the single management point is referred to as the SV active switch. The peer chassis is referred to as the SV standby switch. The SV standby switch is also measured a hot-standby switch, since it is ready to become the active switch and take over all functions if something happens to the active switch. Below is the command showing the active and passive switch. In our next article, we will discuss about StackWise virtual MAC addresses, StackWise Virtual Link, StackWise virtual link redundancy, Multiple StackWise Virtual domains, StackWise virtual mode, Switch failover scenarios, dual-active scenario, Fast hello detection.